One of the most compelling arguments for cooperative learning is that it actively engages students to learn in a collaborative environment. Students who have the opportunity to be a part of a team are more apt to claim ownership of the material (individual accountability). Small group activities are not new to the classroom. Traditionally, students have always gathered to study, practice, and present but there is a growing acknowledgment that combined with whole group instruction and individual work, collaborative classroom learning is a powerful teaching strategy. To accomplish the goal, everyone must pull their own weight, communicate, exchange ideas, and suggest solutions. These group activities will promote intellectual growth and prepare our youth for the next chapter. In cooperative classrooms, the lecturing/listening/note-taking process may not disappear entirely, but it lives alongside other processes that are based in students’ discussion and active work with the course material. Regardless of the specific approach taken or how much of the lecture-based course is replaced, the goal is the same: to shift learning from a teacher-centered to a student-centered model. So what does a cooperative or collaborative classroom look like? Collaboration stations should be large enough for 5-6 students, and these students should have the ability to face each other (i.e. circle or face-to-face). A place where there are minimal distractions would be ideal. 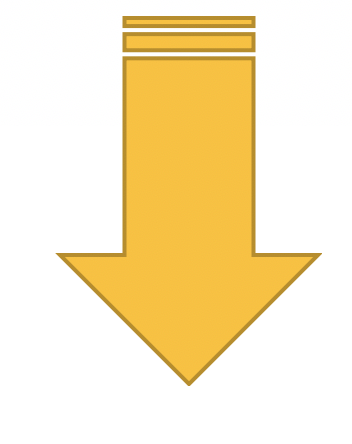 Keep scrolling to view some visual solutions! Related: Before you dive into this topic, it might help to read more on the different zones of the Living Classroom, here. Or, explore setup options for Zone 2: Learn. Collaborative learning is an educational approach to teaching and learning that involves groups of students working together to solve a problem, complete a task, or create a product. Students with different levels of ability use a variety of learning activities to improve their understanding of a subject. Each member is not only responsible for learning what is taught but also for helping their peers learn. Students and teachers alike need to know how to collaborate effectively by taking ownership of their parts. This strategy builds an active learning community that supports, uplifts and empowers each other. Teachers can be expected to introduce interpersonal skills such as making eye contact and using inside voices. During collaborative work, teachers can be found facilitating healthy debates and cheering them on. Encouragement is vital when it comes to promoting behaviors that promote equal exchange among teammates. Jigsaw – a comprehension strategy. See it in action here! Group work takes commitment and can be a difficult transition if students and teachers are accustomed to a traditional classroom. Giving control to the students allows them the ability to own their education. They have the opportunity to try new ideas, gain confidence amongst their peers and listen to one another. Group work isn’t for everyone, but it’s a necessary skill needed for our youngsters to succeed in the real world. Below are a few cooperative learning components to help your class excel. 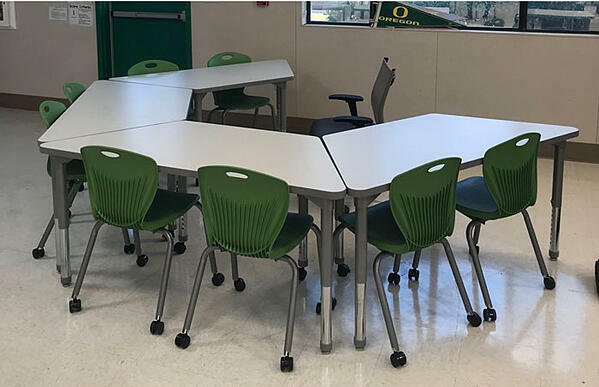 Collaborative learning furniture could include tables and desks with markerboard surfaces where students and teachers can easily collaborate and work out problems. 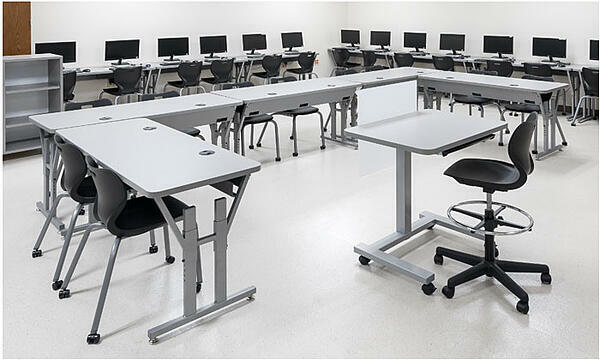 The ARISE Workstation allows the teacher to navigate throughout the room with ease. This configuration gives the teacher or student the opportunity to present to a large group of students in a friendly setting. This would be an excellent setup for debates, round table discussions, or presentations. Shape tables can easily be reconfigured to accommodate a collaborative learning environment. Combine the individual Trapezoid Shape Tables to create a flexible learning environment that can accommodate up to 11 students plus the teacher. When you need a space for individual or small group work, break them apart and move accordingly. Collaborate in comfort! Learning doesn’t always take place in the classroom. You can learn anywhere! 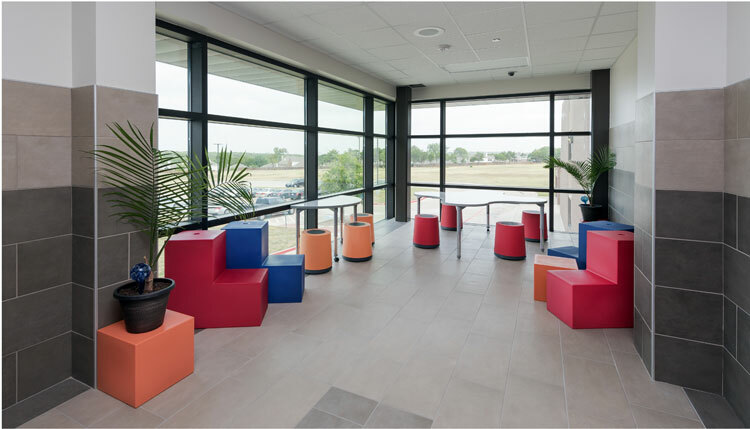 The cooperative learning components of this space include adaptable seating solutions such as Alphabet BLOC & STP and Alphabet MOV. Use them together as casual seating around Discover Shape Tables to create fun collaborative learning spaces. Today’s classrooms are smarter, more connected, and adaptive to a range of learning styles. 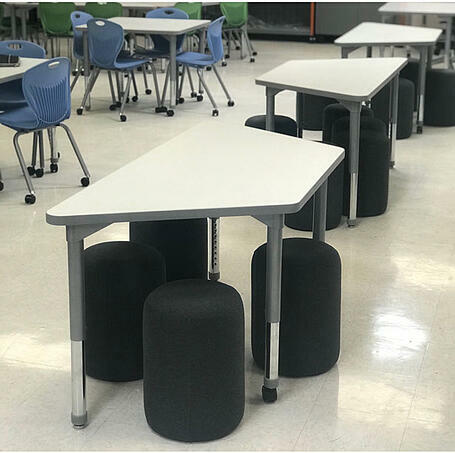 This shift requires classroom furnishings that support active learning and provide educators vital options to help them create a collaborative classroom for their students. To learn more about how schools are approaching classroom conversions or to map out the plan for your own classroom, download our Collaborative Conversion brochure, or visit with one of our local partners.